There's a cheat code for Windows' "Minesweeper" game: type xyzzy, followed by ENTER and the right SHIFT key. Then a tiny dot will appear at the top left corner of the screen that will change color depending on whether the cursor is over a bomb or not. Data General's AOS/VS operating system had an undocumented command named "XYZZY." In the original 16-bit version, the response was: "Nothing happens." In a later 32-bit version, this was amended to: "Twice as much happens." 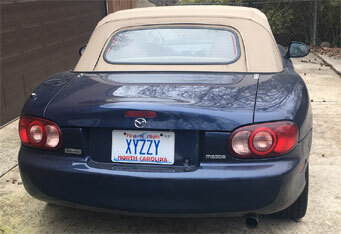 A number of people in various states have personalized license plates "XYZZY." For one example, see http://xyzzy.com. Do you have an XYZZY license plate? Let me know! "...If you use guessable [passwords] like XYZZY... my 12-year-old daughter could be reading your messages inside a day."  Martin Heller, Windows Magazine, July 1, 1994.
has propagated widely throughout both academia and the computing community. This nonsensical string of consonants is still a part of the vocabulary of many who participated in computing's earliest days. You find mentions of it everywhere. 'XYZZY' (along with other phrases from the game such as "...you are in a twisty maze of passageways, all alike") can be found in computer documentation, classroom discussions, and in many other surprising contexts. But where did XYZZY come from? Is it totally a nonsense word, or was there some hidden meaning? There are two stories on its origins. "As for 'out of whole cloth,' I meant just what the idiom means: he devised this little pseudo-puzzle and needed a magic word to make it happen, and he just made one up. It has no antecedent nor is it an acronym or anything like that." "[XYZZY is] taught by math teachers the world around as a mnemonic device to remember how to do cross products. "Indeed. The cross product of two three-dimensional vectors is the vector whose length is the area of the parallelogram with the two given vectors as adjacent sides, and direction perpendicular to the plane of that parallelogram. "Notice that the second and third equations can be obtained from the first by simply rotating the subscripts, x -> y -> z -> x. The problem, of course, is how to remember the first equation. "You do that by remembering the 'magic word,' consisting of the subscripts, taken in order: xyzzy. "And that, friends, is the origin of the magic word xyzzy. This use of the word was around long before Adventure (or Colossal Caves or whatever name you knew it by) was ever written. "When I first played Adventure, finding 'xyzzy' in it was like finding an old friend in an unlikely place. Or an inside joke." Email your XYZZY sightings to webmaster@rickadams.org today!